The Australian experience of war in all its complexity - from the homefront as well as the battlefront - as the men and women who experienced it chose to understand and remember it. The Great War is, for many Australians, the event that defined our nation. The larrikin diggers, trench warfare, and the landing at Gallipoli have become the stuff of the Anzac ‘legend’. But it was also a war fought by the families at home. Their resilience in the face of hardship, their stoic acceptance of enormous casualty lists and their belief that their cause was just, made the war effort possible. 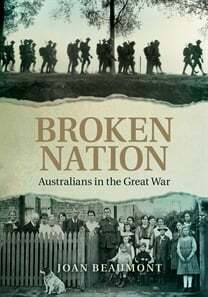 Broken Nation is the first book to bring together all the dimensions of World War I. Combining deep scholarship with powerful storytelling, Joan Beaumont brings the war years to life: from the well-known battles at Gallipoli, Pozieres, Fromelles and Villers-Bretonneux, to the lesser known battles in Europe and the Middle East; from the ferocious debates over conscription to the disillusioning Paris peace conference and the devastating ‘Spanish’ flu the soldiers brought home. We witness the fear and courage of tens of thousands of soldiers, grapple with the strategic nightmares confronting the commanders, and come to understand the impact on Australians at home and at the front of death on an unprecedented scale. 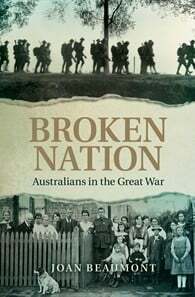 A century after the Great War, Broken Nation brings lucid insight into the dramatic events, mass grief and political turmoil that makes the memory of this terrible war central to Australia’s history. Professor Joan Beaumont is an internationally recognized historian of Australia in the two world wars, Australian defence and foreign policy, the history of prisoners of war and the memory and heritage of war. Her publications include the critically acclaimed Broken Nation: Australians and the Great War (Allen & Unwin, 2013), winner of the 2014 NSW Premier's Prize (Australian History) and shortlisted for the 2014 Prime Minister's Literary Award (Australian History), 2014 WA Premier's Prize (non-fiction) and the 2014 Council for the Humanities, Arts & Social Sciences Prize for a Book.